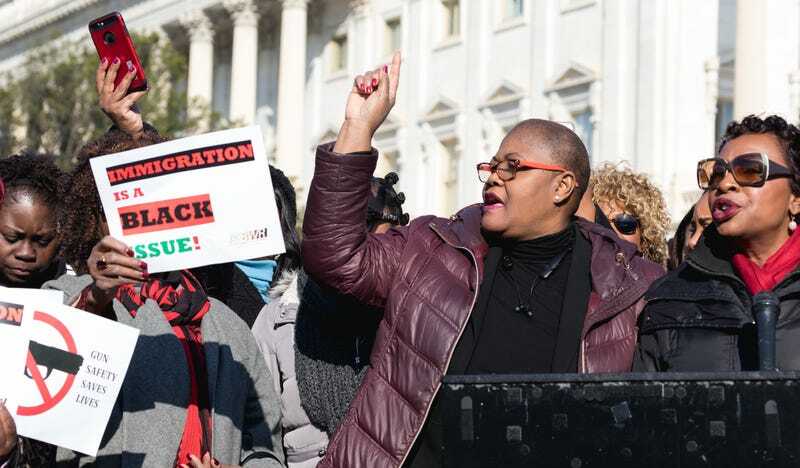 Rep. Yvette Clarke (D-NY 9th District), right, with Melanie L. Campbell (center), President & CEO Convener, Black Womens’ Roundtable (BWR), speaking at the news conference for the BWR, at the U.S. Capitol on Thursday, March 15, 2018. On Friday, the Black Women’s Roundtable (BWR) released the findings of its sixth annual report (PDF), assessing the current status of black women in politics, employment, economics, health, education (including discipline disparity), technology (including digital discrimination), and the Impact of criminal justice, exposure to violence and immigration upon black women and girls. The 125-page report was composed by a 23-member team of prominent contributors that included Melanie L. Campbell, President & CEO of the National Coalition on Black Civic Participation (NCBCP) and National Convener of the Black Women’s Roundtable; 2019 BWR Report Editor-In-Chief Avis Jones-DeWeever, PhD; Ebony Baylor, Director of Civic Engagement for the National Urban League; Lezli Baskerville, PhD, President & CEO of the National Association for Equal Opportunity; Clayola Brown, President of the A. Philip Randolph Institute; Linda Goler Blount, President & CEO of the Black Women’s Health Imperative; Barbara Perkins, Co-Founder & President of the International Black Women’s Public Policy Institute; Elsie Scott, PhD, Interim President of the Congressional Black Caucus Foundation; Rhonda Vonshay Sharpe, President & Founder of the Women’s Institute for Science, Equity and Race; Danyelle Solomon, Vice President of Race & Ethnicity Policy for the Center for American Progress; and Stacey Stewart, President & CEO of the March of Dimes. This year’s report uncovers where Black women stand, juxtaposed between a historic electoral season which resulted in record-breaking political representation and the beginning of a high-stakes Presidential race that includes an exceedingly diverse slate of candidates, including the third Black woman ever to launch a Presidential bid. In many ways, this historic moment seems to be one in which Black women are asserting their power like never before. Yet, they still face substantial challenges related to a wide ranging of deeply entrenched issues that have seen little movement over the years. It was a tremendous year for black women in politics, as during the 2018 midterm elections, record numbers of black women ran for political office at all levels of government. Additionally, the near-election of Stacey Abrams (Ga.) as the country’s first black woman governor, the election of 17 black women as judges in Harris County, Texas, and the upcoming runoff between Toni Preckwinkle and Lori Lightfoot to become the next mayor of Chicago (and the first to be a black woman), indicate a rising tide of both political involvement and support for black women in the political arena. Exit polls indicated that over 70 percent of black women surveyed rated the following issues as very important: affordable health care; criminal justice reform; equal rights and pay; hate crimes and racism; employment; and voting rights. Fifty-percent identified protecting Medicare, Medicaid and Social Security as their top policy priority, and one-third identified protecting affordable healthcare as their second highest policy priority. Economically, black women remain at a disadvantage. Despite having a higher rate of participation in the workforce (60.3 percent compared to a little over 56 percent for white women, Asian American women, and Latinas), on average they still make $.61 to each dollar earned by their white male counterparts, which causes them to lose an estimated $946,120 over a 40-year career. The wealth gap between black and white women is even more significant, and not decreased by factors like education, marriage and home ownership. Compounding this is the fact that more than 70 percent of black mothers are either the sole or primary breadwinners for their families, and black women are disproportionately targeted by discriminatory and abusive behavior at work. The maternal mortality rate of black women is, on average, four times that of white women across socioeconomic backgrounds. In New York City, it is estimated that the rate of death during childbirth for black women is a staggering 12 times higher. “The top complaint black women have during and after childbirth is that their providers (MDs and nurses) didn’t listen to them when they tried repeatedly to tell them something was wrong,” the report notes. The 12 percent suspension rate for school-aged black girls is significantly higher than girls of any other race and even most boys—the margin widens further for black girls who identify as LGBTQIA. Though they comprise just 14 percent of the general youth population, one-third of girls and young women within the juvenile system are black. Colorism is also a factor, as BWR’s research reveals dark-skinned girls are suspended and expelled more harshly and frequently than those with lighter skin. When they aren’t being punished, black girls are often being ignored in schools, as BWR’s sources revealed that teachers, administrators, and policymakers often overlook them because of implicit bias. Nevertheless, BWR’s findings suggest that mentorship is particularly helpful in combating this issue, and that if and when they make it to higher education, black women are thriving as students and leaders. Digital discrimination presents a new obstacle for black women, as it is now often used as criteria for hiring, approvals of loans, healthcare, etc. ; a fact that is especially relevant, considering that black women are often the head of their households. Black women also continue to be underrepresented in STEM fields and are the least likely to garner funding for startups. BWR’s full report explores these issues in greater detail, as well as including findings on domestic and community violence and over-policing, and action items and initiatives. The report can be downloaded on the NCBCP website.